The reasons that led Ernst May to promote the making of this series of short films cannot be entirely and definitively reconstructed. However, there is no doubt that they coincided with the CIAM of Frankfurt in 1929 - 'Die Wohnung fur das Existenzminimum' - and with the themes of that event: the design of a small, standardised home, the furnishing of the home and the prefabrication of the building components for a new way of organising the building site. Ernst May's will to recount, to clarify, to demonstrate and to explain to a non-specialist audience is conscious and deep-seated, as shown by his work for 'Das Neue Frankfurt', Monatszeitschrift für die Fragen der Großstadtgestaltung (a monthly publication on urban development questions), launched by him in Frankfurt in 1926. 'This monthly periodical must become a guide for the progressive development of our city for its inhabitants and show them how the old Frankfurt is transformed into the new'(1). The activity of informing was not to exclude any of the available channels. Indeed, the group working on the magazine was to organise a series of travelling exhibitions on the fundamental themes of the Neue Bauen, to set up an association for the involvement of the citizens, to establish relations with schools by organising courses and guided tours of the Siedlungen under construction and to publicise the thoughts not only of May, but also of Gropius, Le Courbusier and Van de Valden on town planning matters via Frankfurt Radio. Despite this, only one indirect item (the source is Ella Bermann-Michel, an artist working in Frankfurt and maker of short films on social questions in these years (2) ) testifies to the screening of the four documentaries during the CIAM of 1929. Neus Bauen in Frankfurt am Main cinematographically documents the 'Frankfurter Montagenverfahren' or 'May'sche Plattenbauweise' patent for the factory production of individual modular panels for overlaying and affixing on site. The construction firm is Philipp Holzmann A.G. of Frankfurt; the site where the work shown in the film takes place is that of the Siedlung Praunheim (3) . 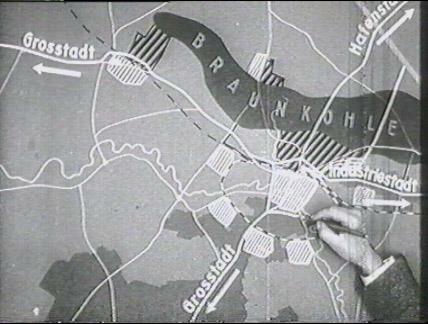 Die Häurerfabrik der Städt Frankfurt am Main (House construction in the city of Frankfurt), almost identical to the first film apart from the final frames, is dedicated to the 'Bron' patent used by the 'German Construction Company' 'Occident s.r.l. of Berlin' and also illustrates the prefabrication of walls already fitted with doors and windows inserted into the casting. Die Frankfurter Kleinstwohnung (Minimum Housing), made by the photographer Paul Wolff, who worked with May on several occasions, relates the layout of the house to the size of the family that will live in it. Animation is followed by images of the daily life of a typical family (father, mother and a son of about three), living in the Siedlung Praunheim, shot at different times of the day (breakfast, a visit, lunch, etc.). The action of the actors in the interior space of the house serves mainly to show the use of furnishings, also specially designed. Finally, Die Frankfurter Kuche (The Frankfurt Kitchen, according to the design by Grete Schütte Lihotzky) is intended to show the savings in time and work that can be made in the activity of the woman in the home. The old, traditional kitchen is here compared with the new, of which the fixed units and equipment have been designed to be an integral part. The old kitchen required 90 metres of movements made many times over the course of a day. In the newly conceived kitchen, the same movements are limited to just eight metres. 'Just as in factory or office work, greater production is the result of a reduced waste of energy', explains the subtitle. The slow, meticulous illustration of every minute detail in these films effectively transmits this message: the architects' design is able to precisely control all stages of the construction of the new city; those who will live in these houses are guaranteed that the same attention has been given to forecasting their daily needs. This is how Manfredo Tafuri summarised the sense of that proposal: 'Standardisation of the minimum elements of the cell at experimental sites, such as those of Praunheim or Riedhof-West, the installations of RömerStädt, about which Lewis Mumford speaks of 'prophecies of a new civilisation', … are there to 'demonstrate', to indicate a future for 'the hygienic man', who knows how to recognise the premise for his own 'reconstruction'(5) in the total introjection of taylorism. (1) Cfr. E. May. Das Neue Frankfurt, in 'Das Neue Frankfurt', No. 1, Oct-Nov. 1926. (2) Cfr. M. Magagnin, Neus Bauen in Frankfurt am Main, IUAV doctorate thesis of 1996-7, p. 46, No. 8. (3) Cfr. E. May, Mechanisierung des Wohnungsbaus, in 'das Neue Frankfurt', No.2, December 1926, p.33-39. (4) 'It becomes difficult to live in a house, even if it is arranged in the best way possible, if there is a desire to use old furniture that is unsuitable to the sizes of the rooms. (6) Cfr, M. Tafuri, La sfera e il labirinto, Einaudi, Torino, 1980.